This morning one of the ColdFusion support forums I subscribe to asked about how one could work with a ColdFusion query sent over Ajax to jQuery. I whipped up a quick example of one way (remember - like ColdFusion - there are many ways to do things in jQuery) you could do it. To start off, I’ll show the CFC I’ll be using to feed data to the Ajax-based front end. Notice how nothing in it is Ajax-specific. Outside of the fact that it has remote access, this is just a vanilla script-based CFC. The component has one method, getArt. It allows for an optional search search. 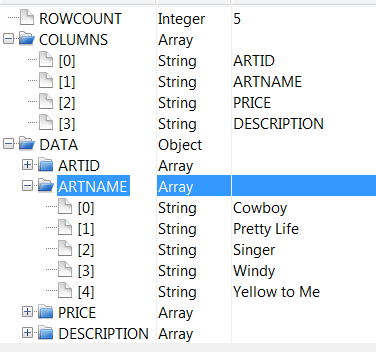 When run we query against the art table that ships with the ColdFusion samples and returns the id, name, price, and description of each piece of art. Now let's look at the front end. Now let's go back to the code. The first thing we do is grab (and trim) the search text. We want to allow you to get data even if you don't enter anything so we don't leave the method if the value is empty. Next we do the actual POST operation. I could have used a GET here since the amount of text you end up sending will be small, but POST just seems safer to me. If you want to see this in action, hit the big Demo button below. As always, I recommend using a tool like Firebug, Charles, or Chrome's Dev Tools, so you can see the data flowing in the background.